Where we relaxed at the home place, counting cars on a Saturday night, swinging on the porch and eating watermelon! Be grateful for calm skies . . .
I’m going to enjoy every second, and I’m going to know I’m enjoying it while I’m enjoying it. Most people don’t live; they just race. They are trying to reach some goal far away on the horizon, and in the heat of the going they get so breathless and panting that they lost sight of the beautiful, tranquil country they are passing through; and then the first thing they know, they are old and worn out, and it doesn’t make any difference whether they’ve reach the goal or not. It’s bed time, don’t over do the studying business – take time to live. In our life there is a single color, as on an artist’s palette, which provides the meaning for life and art. It is the color of Love. 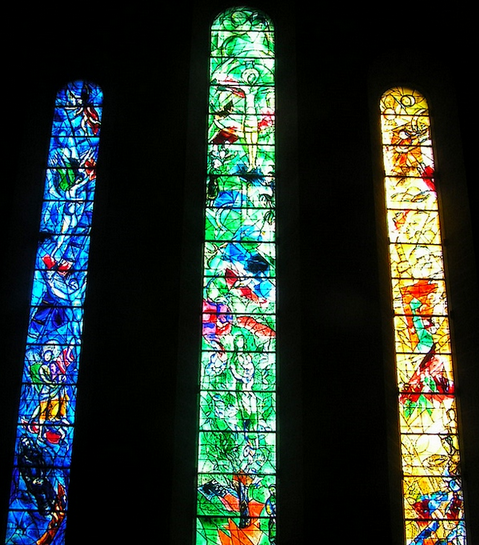 Chagall’s stained glass windows are displayed in Fraümunster Church in Zurich, Switzerland. His images often seem to tumble, but always stay airborne. Floaty and flexible. Floaty and flexible. Try that feeling on for size right now . . .
We love words. Here’s where to share a relaxing thought, a quote, a suggestion. Oh my goodness, Marian! It’s like you were reading my mind this morning. I was thinking about the ideas in your first section. The Dickinson poem is thought provoking, as her simple lines often are, and your Grandmother’s line is wonderful. It’s also wonderful that you still have the letter! I’m coveting your porch–it looks so calm and inviting. My husband and I went to a Chagall exhibit many years ago. We have a print of a detail from a stained glass window he did for UNICEF. The stained glass windows in this photo are ethereal. I also liked his quotation and the one by Casals. Thank you for noting all the “meshing” here, similar thoughts and quote lines, Merril. Mother’s house was sold last year, and when I go to Pennsylvania soon, we’ll drive by the house with new owners. Fortunately, our memories are intact. Cliff and I saw the actual stained glass windows in Zurich, but my photo was so blurry back then I resorted to a clearer image, borrowed. I love Cliff’s butterfly picture, and your grandmother’s letter: “It’s bed time, don’t over do the studying business – take time to live.” You’ll see why that strikes a special chord for me in my next blog post next week (not to tease you). Again, how interesting our thoughts are following similar paths. Maybe it’s the time of year – or simply the call to relax. Your quote is perfect for this space. No, I’m not familiar with Peace Pilgrim, but I will click on the link as soon as I press “post.” Thanks, Melodie. Cliff took the butterfly photo in my mother’s back yard last August during the week of her memorial service. I like to think that butterflies serve as good metaphors for the idea of resurrection and re-birth. Oh that is special about the butterfly. Thanks for filling me in. You describe many high-energy, high-achieving folks. But now in Spain I’m thinking you are surrounded by people in a culture that moves to a different tempo. Do they still take siestas? I’m trying to lie down every afternoon for at least 20 minutes. Maybe I won’t sleep like Grandma did, but at least I’ll let my soul catch up to my body, another one of her sayings. Yes, many still take siestas. We have been taking naps in the afternoon, sometimes. My book mark says Snack Nap. I love your grandma´s sayng. I’m ready for a nap right now. Twenty minutes was all it took for Grandma to get rejuvenated. I hope the same works for me! I remember this neat porch swing! Another family lives in the house now, but I think the porch swing is still there. wonderful quotes and images, Marian! I hope it’s cooler in Virginia and it is in Florida today. All so beautiful, meaningful and calming Marian thank you so much! I’ll be saving the post to look at the images again. The butterfly – from it’s cocoon – it reminds me of an Anais Nin quote: ‘ And the day came when the risk to remain tight in a bud was more painful than the risk it took to blossom’. Oh, Susan. A while ago I wrote a short essay sub-titled “My Getaway Car,” and the quote I used from the Anais Nin quote you cited here. Love it too! Apparently you are the ring-leader in your family circus, Gloria. I would tell you to enjoy these moments because time is so fleeting, but that wouldn’t help you much now. I remember when our last child Joel left. There was no ring of cars around the perimeter of our property any more and no thumping noises in the family room. The silence in the house was deafening. I felt a little sad at first but zoomed to a happy place very quickly. Ahhhh! Cliff’s photograph of the butterfly is amazing! Grandma was always coming up with clever quips. She sometimes surprised us in other ways too – reading tea leaves, for example – odd for an old-fashioned Mennonite woman. 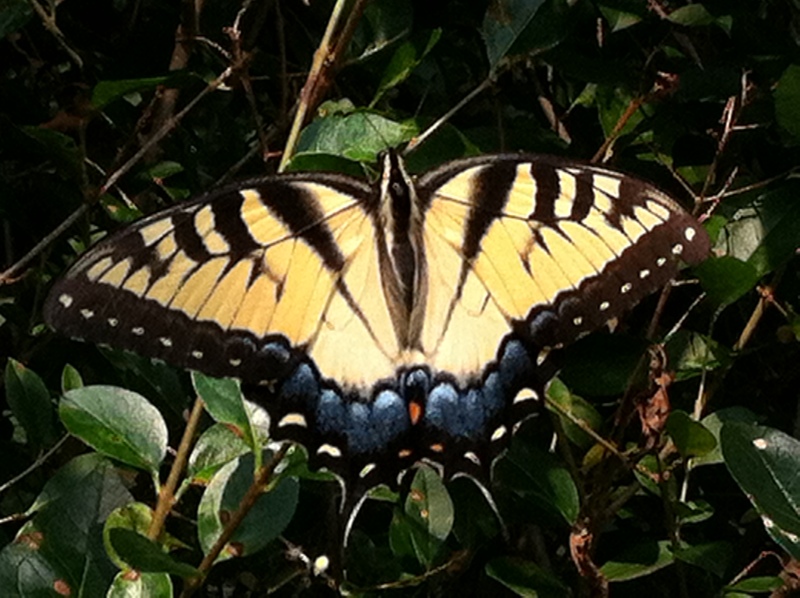 Maybe the butterfly was napping for a second – taken with only Cliff’s iPhone. I’ll pass along the compliment, Laura. Oh my gosh, I love that your grandma read tea leaves! I don’t think Grandma knew much about tesseography; she liked to make things up. It didn’t occur to me to quiz her about it. It’s anybody’s guess where she got her knowledge from. Sorry, I just realized I misspelled your grandmother’s last name: Longenencker. It’s actually Longenecker, a name sometimes embarrassing to me as a teen. About the quote: I don’t think most of us actually savor the “now.” At least I don’t. These maxims help us restore balance every so often. At least that’s what I think. Judy, thanks always for your wise observations here. This morning my cup is full to the brim of beauty . Where do I start , the roses ,the tranquil evening , that quote by Emily Dickinson , the stained glass widows , the butterfly . I have always wondered why some of us see beauty in all around us and others just pass it by . I collect quotes like others collect antiques . I’m like a squirrel . I have beautiful note books everywhere . Of course when you are looking for your favourite , can you find them 😆 anyway here’s one I quite like from the beautiful Audrey Hepburn . Just recently I saw the Audrey Hepburn quote, perhaps on Facebook. Thank you for squirreling it away and sharing it here, Cherry. It’s rather like the Golden Rule. Yes, attitude is everything. Thank you always for your cheery disposition and happy deposits in this comment section, so appreciated! I love the Chagal quote about Love. When I recently visited his paintings in the Museum of Modern Art in New York City, I felt once again the love and joy that poured from his brush. Thank you for great quotes and thoughts. Art expresses love eloquently: writing, painting, stained glass, sculpting . . . . I know we both celebrate that truth. The post itself was delightfully relaxing, Marian, with all the wonderful pictures and quotes. But my favorite picture was the first one. 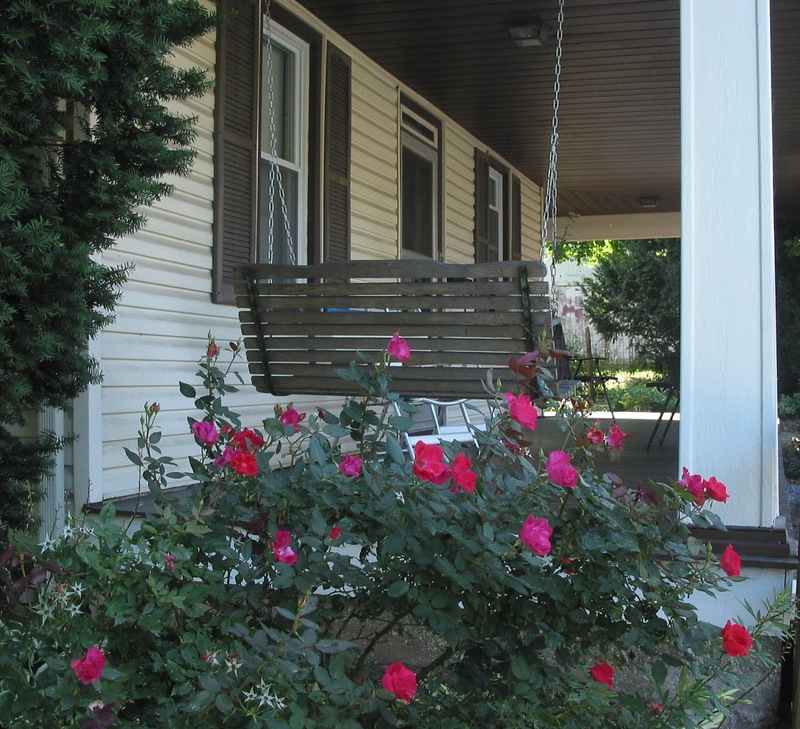 It is so similar to my grandparents’ Missouri home in the summer, with roses in bloom, and also huge purple clematis blossoms crawling up the trellis next to the porch railing. We would swing and swing, singing songs that we loved even though couldn’t quite remember all the words, and Grandma would laugh and help us figure out the words…or make some up. But we ate watermelon, we had to leave the swing, get off the porch and out into the grass, because we always ended up spitting seeds on each other! I’m glad this post sparked a memory that matches mine and added something else: spitting watermelon seeds. We lived in a sensory-rich and sensible era and didn’t realize it then. Wonderful shots – and a great quotation by Emily Dickinson. Thanks for stopping in, Fiona. 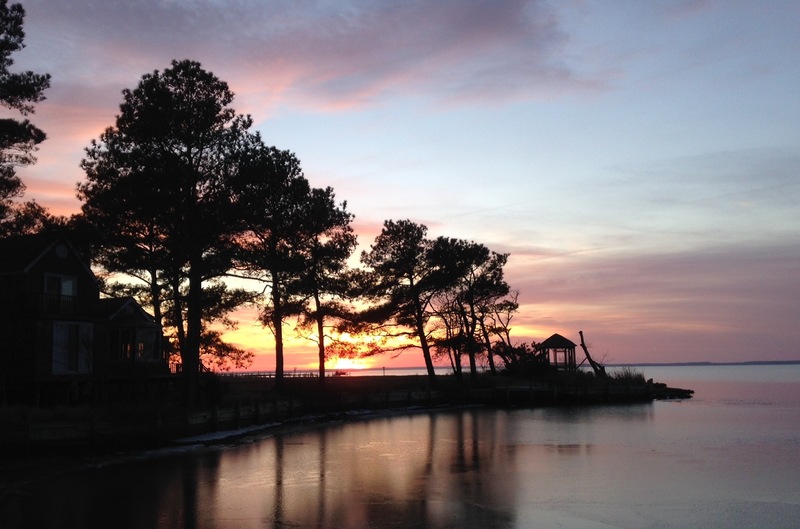 We brighten the world with beauty captured with our cameras. How wonderful to have our blogs to share these every week! Exactly, Debby. Are you wearing that “famous” bracelet – ha!